So you wanna be a Nightclub Bartender…. Do you enjoy big crowds, loud music, perform well under pressure and good at handling money? Then the Nightclub business is definitely for you! Bartenders are required to have an extensive knowledge of highballs, cocktails, shooters and even beer. The business can be demanding! The hours run late and long. You need to keep up with the fast pace environment, while maintaining a level head in case something goes awry. Nightclubs always have trouble hiring properly trained bartenders. Hands on experience and extensive training help immensely! Many bartenders are just there for the money. Some were just in the right place at the right time, thrown into the deep end, and now have to learn on the job. Bartenders who excel in the Nightlife are the those who care! 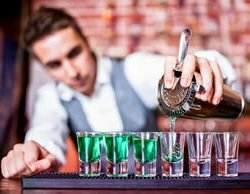 Having some fine dining bartending experience helps a bit in this fast paced environment, but it is better if you have some event bartending experience. Event bartenders have a much better understanding of filling orders for crowds quickly. If you are someone who can work with a smile on their face while interacting with your patrons, then success will find you very quickly. When the same customers start lining up at your bar over and over, you know you are doing something right and have made an impression. Keep it up! Having a good memory is another key element to what makes a great Nightclub Bartender. Much like driving ‘stick;’ if you can Bartend in a Nightclub, you can Bartend anywhere! In restaurants and bars you have a set cocktail list to memorize, in a Nightclub you must be prepared for any kind of drink. A Bartender who can remember each customer’s drink order, and whip those drinks up in a timely fashion… all with a smile on his or her face… has won the customers respect and maybe even a gratuity. FAST MONEY is a big component of the Nightclub world. There are a lot of ‘dollar bills’ flying around on any given night. You have to know your register and Point of Sale system. You also need to be quick at math and how to make proper change back in a way that maximizes your tips. Unfortunately there is a lot of theft in the Nightclub business, don’t be that Guy or Girl! Tips are “To Insure Prompt Service” meaning your work ethic and attitude will be rewarded accordingly. Don’t be mad if a customer doesn’t tip, there is always the next customer to wow! Finally, if you are well known, have a lot of friends or are a University student, then you have an extra in with Nightclubs. Businesses are looking for well rounded, likeable, charismatic individuals to help make their club stand out! To managers and owners, it’s all about getting bodies in the door and keeping them there. Don’t be afraid to stand out and make your presence known in the Nightclub industry. Managers love well trained big personalities behind the bar. Being well mannered, able to manage their time and keep up with the flow of the night also helps. Nightclub Bartending is truly a once in a lifetime experience, go out and get it! At Fine Art Bartending will train you up as a bartender. We teach you all the ins and outs needed to succeed, which many in the bartending industry just won’t have time to step you through. Register today, and find out what makes a great bartender!